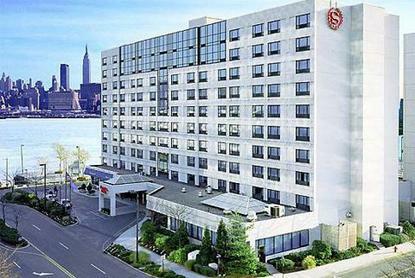 The Sheraton Suites on the Hudson is an all-suite hotel situated right on the Hudson River, with spectacular views of the entire New York City skyline. Located only a half-mile from Manhattan, the hotel offers easy access via the New York Waterway Ferry right outside the hotel door. Each suite features a parlor with sleeper sofa, a wet bar, a refrigerator, a microwave, a coffeemaker, an iron and an ironing board, an in-room safe and two dual-line speakerphones with data ports.Special ConditionFrom February 27 to September 5, 2006, The Harbor Bar and Brasserie will be closed for renovations. During this time room service will be limited and the guest service staff can assist with dining options. Please contact the hotel for further information.